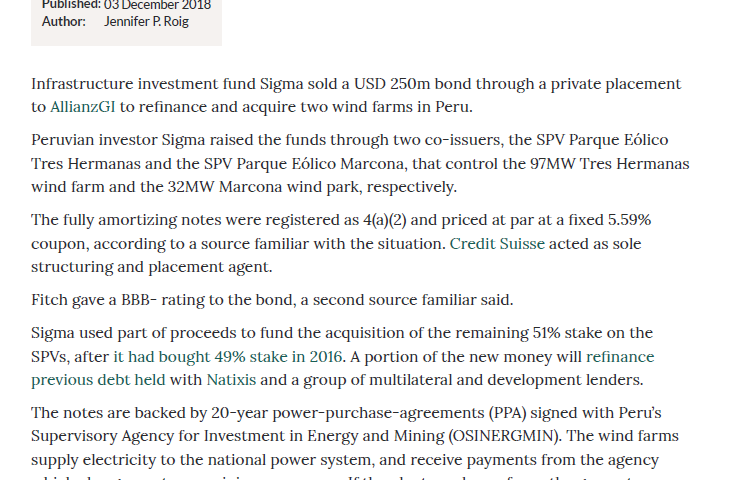 Infrastructure investment fund Sigma sold a USD 250m bond through a private placement to AllianzGI to refinance and acquire two wind farms in Peru. Peruvian investor Sigma raised the funds through two co-issuers, the SPV Parque Eólico Tres Hermanas and the SPV Parque Eólico Marcona, that control the 97MW Tres Hermanas wind farm and the 32MW Marcona wind park, respectively. The fully amortizing notes were registered as 4(a)(2) and priced at par at a fixed 5.59% coupon, according to a source familiar with the situation. Credit Suisse acted as sole structuring and placement agent. Fitch gave a BBB- rating to the bond, a second source familiar said. Sigma used part of proceeds to fund the acquisition of the remaining 51% stake on the SPVs, after it had bought 49% stake in 2016. A portion of the new money will refinance previous debt held with Natixis and a group of multilateral and development lenders. The notes are backed by 20-year power-purchase-agreements (PPA) signed with Peru’s Supervisory Agency for Investment in Energy and Mining (OSINERGMIN). The wind farms supply electricity to the national power system, and receive payments from the agency which also guarantees a minimum revenue. If the plants underperform, the generator would have to pay a penalty to OSINERGMIN. When asked about what structural elements of the transaction address the power generation commitments under the PPAs, Jorge Camiña, director with the AllianzGI Infrastructure Debt team, said that the sizing of the debt is the most important element proving comfort to the bondholder. The assets have a proven track record of generation and the debt sizing gives a fair buffer to AllianzGI’s investors to protect them from any underperformance of the wind farms, giving room for absorbing potential penalties. According to an ACS 2017 industry report, the Marcona wind farm produces 167,992 GWh of power annually, while Tres Hermanas produces 497,606 GWh of electricity per year. 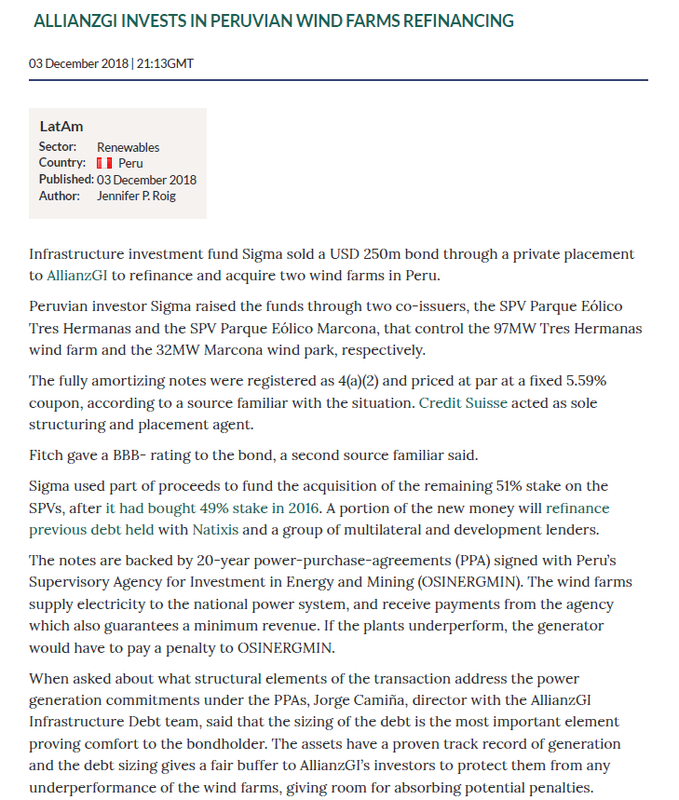 The transaction marks AllianzGI’s first investment in the infrastructure debt market in Peru, with one of the largest bond offerings in the renewable energy sector in the country, said Diego Harman, principal associate at law firm Garrigues, which served as local legal advisor to AllianzGI and Credit Suisse in the deal. Clifford Chance was the international legal advisor to AllianzGI. Meanwhile, Milbank served as international legal counsel to Sigma, and Payet, Rey, Cauvi, Pérez Abogados was the local legal advisor. The 32MW Marcona wind park commenced operations in March 2014, while the 97MW Tres Hermanas wind farm became operational in March 2016, using Siemens wind turbine generators. The projects are located in the province of Nazca, Department of ICA, in southern Peru. Cobra, a subsidiary of the ACS Group, was the original developer. The deal helps to cement a trend in the financing of infrastructure assets in Latin America, where more issuers are having access to alternative sources of funding different from the traditional binary choice between a bank loan and a wider 144A market bond issuance, Gonzalo de las Casas, General Manager of Sigma Capital, said in a press release. This is AllianzGI’s third investment in Latin America, as part of the expanded infrastructure debt strategy initiated in 2018. Previously, Allianz was the sole buyer of Fermaca’s USD 450m bond to refinance the El Encino-La Laguna gas pipeline in Mexico and it also participated as investor in the private placement notes to refinance the solar parks El Naranjal and Del Litoral in Uruguay.